I do not know about you, but I have always been intrigued by the so–called "alternative processes" in photography. In essence, they include the printing methods that are no longer mainstream and practiced by a very small number of photographers. They are usually based upon fairly complex chemical processes and, as a result, tend to have esoteric names that invariably exude magic: the kallitype process, the platinotype process, the palladiotype process, you name it. The magic, however, is not only in the names: each process produces results that stand out in a number of ways and cannot be fully replicated by any other process; moreover, the photographs produced by an alternative printing process usually have their own unique visual aesthetics. So when my friend Lovrenc Gašparin offered me to make a palladium print of an image of my choice, I seized the opportunity without thinking twice—or even once! Palladium prints usually have three significant advantages over prints produced with other printing processes (gelatine silver prints in particular). First, there is archival longevity: a palladium print essentially consists of palladium metal bonded to cotton fibres, and palladium is one of the most stable metals; a palladium print will last as long as the paper it is printed on will, which can easily be in the high hundreds of years. Second, there is high dynamic range. Finally, there is inherent aesthetics. Although the first two points have arguably become moot with the development of modern technologies, the issue of aesthetics remains as pertinent as it has ever been. It is this last point that I was mostly interested in and that this post is mainly about. 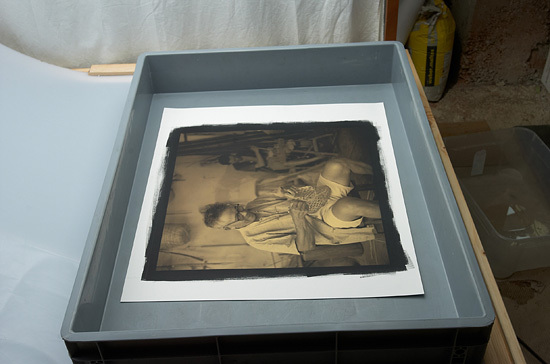 In an ideal world, a palladium print should be produced as a contact print from a large format negative. This implies that you have to use a view camera with 8X10 film, which in this day and age is quite a bit of an "alternative process" in itself. We do not live in an ideal world, though, and a hybrid solution is usually used: produce a digital negative, print it on clear film, and use the printed negative for contact printing. 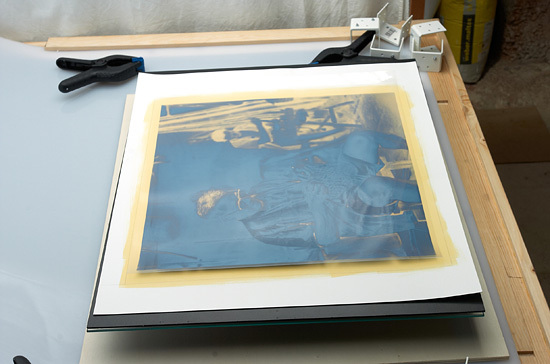 This approach allows producing palladium prints of images captured on virtually any medium including digital; it also gives a greater degree of control of the printing process, because the digital negative can be fine–tuned towards producing a palladium print as desired. I chose the above image for Lovrenc to make a palladium print of—for two reasons. First and foremost, I simply love the photograph, which is enough reason in itself. Second, its aesthetic value primarily lies in image content and tonality (I did not want to use an image where sharpness and detail play an important role). I prepared a 16–bit TIFF file that would allow printing a 40cm by 40cm negative at 360dpi and sent it to Lovrenc. At the same time, I produced a 40cm by 40cm inkjet print of the same image using my Epson 4880 printer. Although comparing the two prints produced with such radically different technologies was my main purpose, I also had the selfish motive of decorating my Madrid dwelling with what promised to be an echoing couple of superb artefacts. Palladium printing is a true craft: it takes a lot of time, expense and experimentation to become proficient at and be able to produce relatively consistent results. No two prints, even the ones made consecutively, will look identical; in other words, each individual print is a subtly unique interpretation of a given image. To give you a glimpse of what is involved in producing a palladium print, let us have a look at the main steps that Lovrenc had to take to produce the print for me. As mentioned above, we first need to produce a negative to use for contact printing. I only have a rough idea as to what goes into preparing a digital negative and printing it, but it certainly is a very complex process. The snapshot above shows the negative of my image after it was just printed. 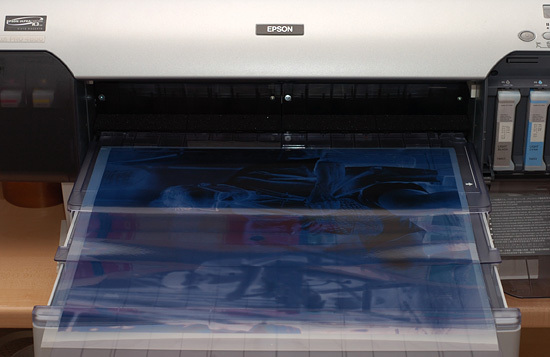 Lovrenc also uses the Epson 4880, which is a 17–inch printer—as you can see, it is a pretty large negative! 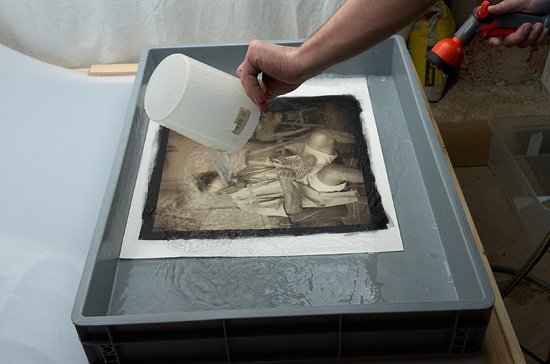 Next, we need to prepare the paper for coating by keeping it in a humidity chamber for two hours (Lovrenc used Bergger COT–320 paper to produce the print). The paper needs to absorb a certain amount of moisture so that the necessary chemical reactions can take place in it. The degree of humidity will influence the final colour rendition: 75% humidity will result in sepia tones, 80% humidity will produce dark brown tones, and to achieve neutral grey tonality one needs 85%–90% humidity (the danger here, however, is that when humidity approaches 90% the contact negative starts to stick to the paper). At the same time, we need to prepare the sensitising coating: for a 40cm by 40cm print, it consists of 2.0ml of ferric ammonium oxalate and 2.0ml of lithium chloropalladite (do not ask me what these chemicals are!). 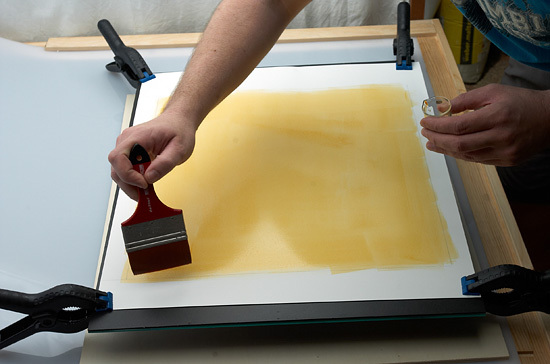 Once the paper and the sensitising coating are ready, we pour the sensitising coating onto the paper and spread it evenly over the image area with a brush. Between four and six passes in each direction produce a nice, even coating. Once that is done, the coating needs to dry for 15 minutes, upon which the coated paper goes back into the humidity chamber for another hour. 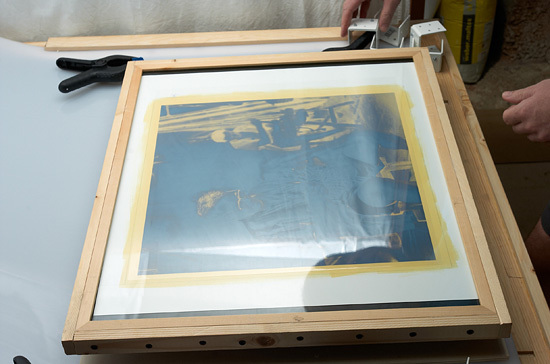 ...and hold it firmly in place with the use of a contact print frame. Upon that, the "sandwich" is put under a UV light source and exposed for six minutes. Because the exposure is done with UV light, you do not need to work in a "dark" room (some daylight can be present, but direct exposure to sunlight must be avoided). The above image shows what the print looks like after it comes from the contact print frame after exposure. The process does not require any post–exposure development, because the print self–develops during exposure. As you can see above, right after exposure the print has a strong yellow cast, which is because of the chemicals that remain in the print. 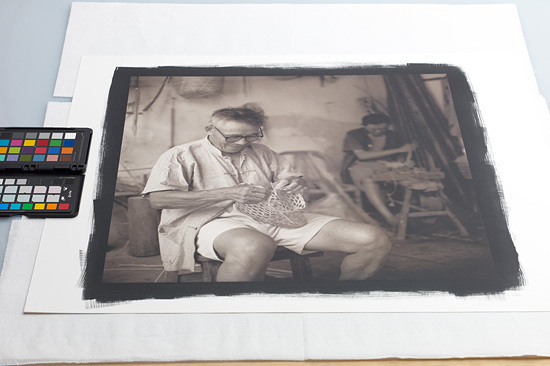 To remove the remains of the chemicals and finalise processing, the print needs to be thoroughly rinsed and washed. First, the print is washed in water. Next, it is washed in a bath of citric acid and a bath of sodium sulphide. 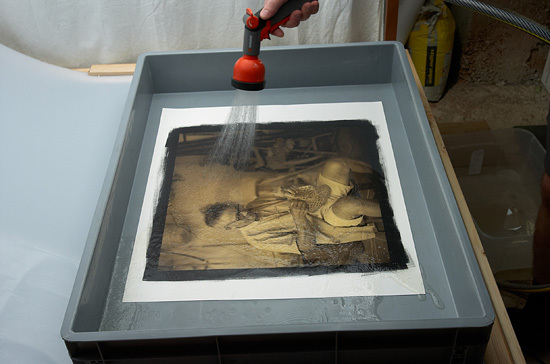 The print spends five minutes in each bath and, once that is done, is washed in water for another sixty minutes before drying. Finally, it dries in ambient environment and voilà—we have a perfect palladium print! 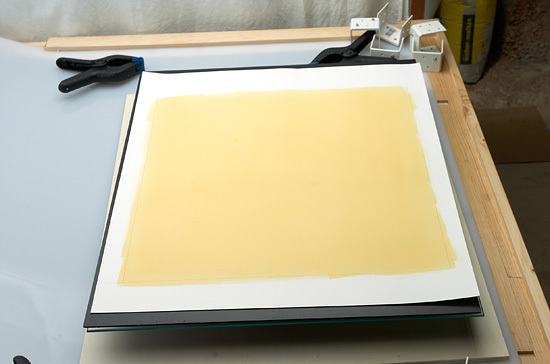 Note that the strong yellow cast is now gone; also, because palladium prints do not contain any gelatine, unlike gelatine silver prints they do not have the tendency to curl. I eagerly anticipated the print to arrive, and finally it has reached me. The above snapshot shows the two prints side by side—Lovrenc's palladium print is on the left and my inkjet print is on the right; I have also included a music CD to give you a sense of scale. My impressions and thoughts essentially took place at two different levels: at the level of first reaction and emotional response, and, later, at the level of calm analysis and close examination. At the level of first reaction, two things immediately filled my mind to the brim. First, the print is simply gorgeous. There is no reasoning or explaining involved in this assertion—I simply stared at it in awe with one exclamation completely occupying my emotions: whoa, man, just look at this! Second, looking at the two prints side by side for the first time, I could not help but be astounded by how drastically different Lovrenc's interpretation of the image is from mine. The famous quote of Ansel Adams, "The negative is the score, and the print the performance," immediately came to my mind. Essentially, Lovrenc and I started from the same (digital) negative, envisioned the final print differently and used distinct technologies; as a result, our interpretations of the image could not be more different (more on this below). At the level of calm analysis, my print seems more assertive and uncompromising; Lovrenc's print, on the other hand, appears more inviting and relaxed. Whereas in my interpretation the background is clearly of secondary importance and serves only as material to fill in the gaps and provide a general sense of the environment, in Lovrenc's rendition it is an almost equally important part of the image that suggests a far stronger interaction between the main subject and the surroundings. Also, the brown toning of Lovrenc's print produces a more moody, nostalgic atmosphere. 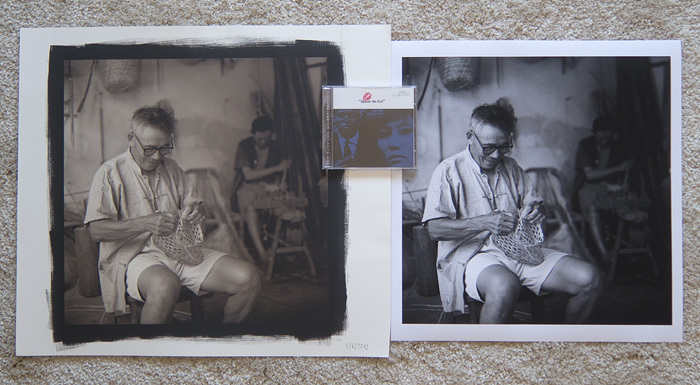 Aside from the print of my image, Lovrenc also kindly sent me two palladium prints of his own images. Although they are smaller in size, they are equally impressive—and stunning artistic statements of and by themselves regardless of what medium they are reproduced on. At close examination, all three prints boast exquisitely smooth tonality. As mentioned above, I cannot comment on sharpness when looking at the print of my image, but one of the Lovrenc's prints clearly shows that, printed right, a palladium print can reproduce intricate detail superbly. Dynamic range is noticeably greater in Lovrenc's print, but this rather reflects my aesthetic choices, not a limitation of inkjet printing. 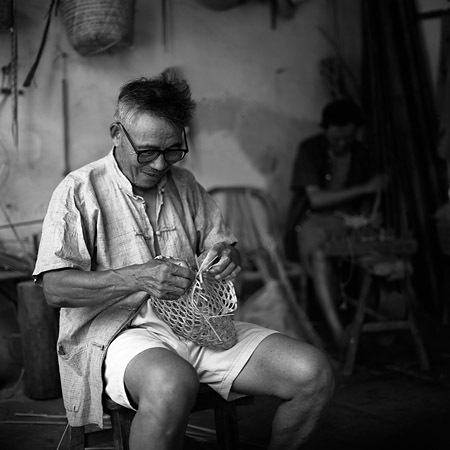 One aspect that I would also like to mention is that in this age of mass production and digital distribution we are gradually forgetting the notion of artefact and the pleasure of appreciating beautiful handmade objects, which the palladium prints undeniably are. The texture of the paper is wonderful, the edges were clearly not cut by a machine, the black token of coating surrounding the image looks artistic, and the signature in pencil together with the seal imprinted in the margin cement the impression that this is a result of labour of love. In comparison, as an artefact my inkjet print looks somewhat plastic and characterless. Of course, it is possible to simulate all the traits of the palladium prints in inkjet photographs, but there will always be a perceptible and inescapable difference between the traits that are a natural result of the production process and the traits that are an afterthought or a simulation. 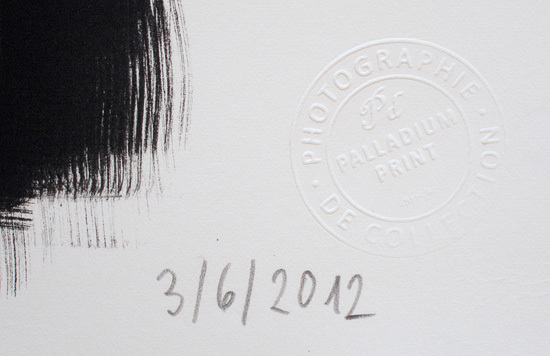 As you might have gathered from my impressions, palladium prints are truly a wonder to behold. If you are pondering whether they are better than inkjet or silver gelatine or any other kind of prints, though, I am afraid the question is not pertinent: palladium prints occupy their own niche and are not better or worse in the absolute sense. Their aesthetics might or might not suit certain images and one's preferences at a given moment, and I imagine there are times when palladium printing is not the best choice for reproduction. When one's aesthetic intentions and the image both favour palladium printing, though, then the medium can be a truly marvellous choice. And as to the image of Watertowns of Jiangnan, I equally love both prints and particularly savour viewing them side by side, for they remind me of the possibility of drastically different yet equally compelling interpretations of the very same work, both in terms of aesthetic choices and reproduction medium. Humidification of paper is no longer necessary for printing with the noble metals. I know, because I invented the formulas that use ascorbic acid in combination with pretty much any double ferric oxalate (generally, ammonium ferric oxalate or lithium ferric oxalate). If you follow this link, you will have the sample chapter from my book on my dry print out processes for gold, gold–platinum, platinum, and the Ziatype variations (palladium, palladium–platinum, palladium–gold, and palladium–platinum–gold). Here is the quintessential formula. You will notice not only is no humidification of paper required, but I specify DRY paper. With my formulas, humidity serves no purpose other than to introduce uncertainty into the process. 1. Prepare a small volume of a 2% solution of ascorbic acid (vitamin C). 2. Prepare 10 ml of ammonium ferric oxalate or lithium ferric oxalate. I prefer lithium ferric oxalate because of its higher contrast than ammonium ferric oxalate. 3. Add 8 drops of 2% ascorbic acid to the 10ml of the double ferric oxalate. Agitate the bottle for 5 to 10 seconds. 4. For an 8x10 print, count into a shot glass 12 drops of this lithium ferric oxalate+C (or of ammonium ferric oxalate+C). I refer to them as LFO–C and AFO–C, respectively, in my book. 5. Count 12 drops of 15% potassium palladium chloride OR of lithium palladium chloride into the shot glass. 8. Brush the solution onto the paper. 9. Set the sensitized paper aside in a dark, dry place for 15 to 30 minutes, until it is dry to the touch. 10. I always place a sheet of 2 mil mylar between my negative and the paper. 11. Expose to a UV light source. 12. When the print exhibits the desired density, immerse it in a tray of ice cold water. This minimizes any initial darkening. 13. After 5 minutes, proceed with clearing the print as you would normally.